Nokia Lumia 735 is powered by the widely used Snapdragon 400 chipset. It has four Cortex-A7 processor cores clocked at 1.2GHz, Adreno 305 graphics common for most of the Windows Phone gang and 1GB RAM. First, we ran the multi-platform compound test BaseMark OS II, which takes in consideration CPU performance, graphics, web benchmark, and memory. Surprisingly, the Lumia 735 posted a poor result compared to its Snapdragon 400 Lumia siblings. Then we ran AnTuTu for Windows Phone and things got a bit better. The benchmark gauges the overall system performance, too, and here Lumia 735 is on par with the Lumia 630. The Lumia 735 isn't chart-topping in the benchmark tests, but Windows Phone devices were never meant to compete on a benchmark basis. It's the real-world performance that matters. Happily, the phone offers a lag-free experience and didn't stutter in every day usage. Some of the more heavy apps opened with a slight delay, but that's about as slow as the phone goes. 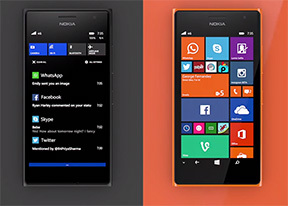 The Lumia 735 offers pleasing performance that would be more than enough for non-power users. Cortana, which premiered on Windows Phone 8.1, is Microsoft's answer to Siri, S Voice and Google Now. It does a pretty good job with voice recognition and it has the potential of helping you out on a number of occasions throughout your day. Cortana is very similar to Siri. The voice comes courtesy of Halo's Jen Taylor and is probably the most human-like sounding virtual assistant we've encountered. It recognizes your voice commands and questions in natural human language and provides voice feedback. So, what can Cortana actually do for you? First you need to personalize it in order to utilize its full potential. The Settings are called Notebook and are divided into Interests, Reminders, Quiet Hours, Inner Circle, Places, and Music Searches. In Interests you can assign literally everything you like and Cortana will help you track specific news, plan trips, find restaurants or bars, and more. Cortana supports reminders including people-based ones - you can tell her to remind you of something next time you call some of your contacts. It also supports reminders by location (home, work, university, stores), so it can remind you to wish a coworker a happy birthday before starting with the work-related questions. Cortana can fully interact with your phone and carry out all kind or commands related to it - make a call, send a message, add appointments, take notes, set alarms, play specific music or playlists, navigate you to locations or simply search the web. It can also turn on/off settings or give you straightforward answers to simple questions. Unique among virtual assistants, Cortana can also forward your commands to third party apps, so you can for example ask it to open Skype and call some of your contacts. Only Skype, Facebook and Twitter currently support this functionality, but others should follow sooner rather than later. As far as the speed of voice recognition is concerned, WP's virtual assistant does a fine job. Words are recognized almost in real time, and the accuracy has greatly improved since its earlier iterations. Siri can do a lot more than Cortana today, while Google Now with its automatically appearing cards is probably the most useful of the bunch, but those two have quite a head start. Microsoft does remind you that Cortana is still in beta, so we expect even better performance and functionality once it's finalized. We'd also like to see Cortana hitting other regions and languages as the US, UK and China are the only ones supported for now. It recently became available in early alpha version in Australia, Canada and India, but this is surely not enough. The good news is you can bypass that limitation by simply changing your region in the settings menu - no complicated hacks required.